Utility Sump Pumps by Active Aqua are powerful and efficient water pumps for the transfer and recirculation of water and nutrient solution. These pumps are ideal for use in hydroponics as well as many other applications including aquariums, ponds, fountains and other water features, and more. Available in two models with transfer capacities of 1479 GPH (this model, AAPC1010) and 2166 GPH (AAPC1020). 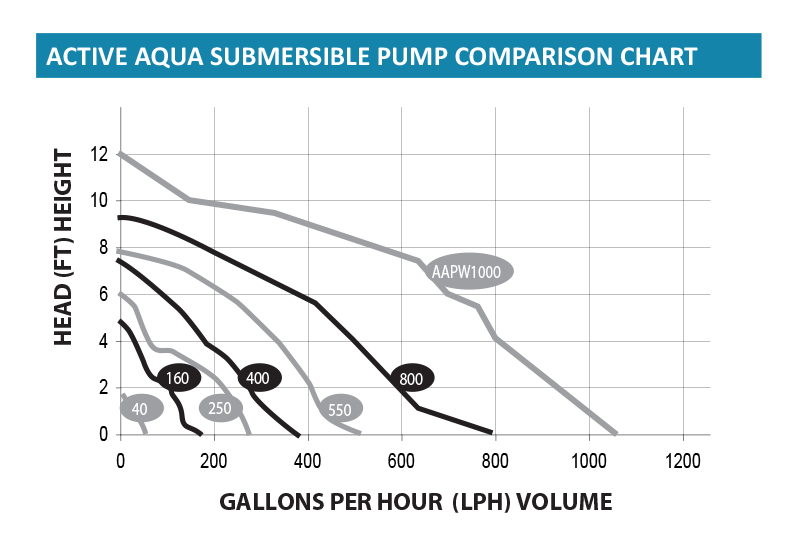 Utility Submersible Pumps by Active Aqua are tough, maximum-capacity water pumps for the transfer and recirculation of water and nutrient solution. These pumps are ideal for use in hydroponics as well as many other applications including aquariums, ponds, fountains and other water features, and more. Available in two models with transfer capacities of 2642 GPH (AAPC2010) and 5284 GPH (this model, AAPC2020). Active Aqua Pro Pumps are designed for hydroponic applications. PRO PUMP’s powerful, efficient mag drive construction and Oil-free environmentally safe fine mesh foam filter will give your hydroponic system reliable clog-free performance. Active Aqua offers a complete line of parts and accessories for your hydroponics settup. Compatible with AA submersible pumps 250GPH (AAPW250), and 400GPH ( AAPW400) - 3/4", 50GPH (AAPW550), and 800GPH ( AAPW800) - 7/8", and 1000GPH (AAPW1000) - 1"